Join us to put the heat on our politicians at this state election to Replace ALL of Hazelwood. We’ve written letters, letterboxed our streets, door-knocked our neighbourhoods, held community meetings and met with our MPs to get them to act on Hazelwood. But now, in the lead up to Victoria’s state election, we’ve got to take the campaign up a notch. So join us on Saturday, 6 November to make sure our politicians get the message – that Victorians want a commitment from all parties before the election to Replace ALL of Hazelwood power station. We can repower Victoria with 100% renewable energy. John Brumby is currently offering to replace 25% of Hazelwood with new coal. He tries to spin his way out of trouble by saying Hazelwood will be closed down entirely while not giving a date. Everything will be closed down eventually! This is not good enough. We need to see you, your family and friends, your workmates, neighbours, school teachers and even your local green grocer there on 6 November. Because we all want a safe climate future. And real action to replace Hazelwood is just the beginning. 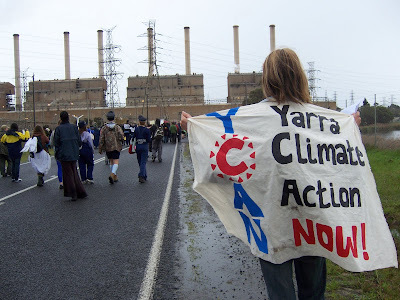 This week Yarra City Council took a stand for sensible action on the climate crisis, passing (six votes to two) a motion calling for Hazelwood power station to be replaced with renewable energy within the next term of the Victorian parliament. The motion also called for the scrapping of the proposed HRL Dual-gas coal-fired power station, which the State Government is currently supporting. See below for the full text of the motion and background information. 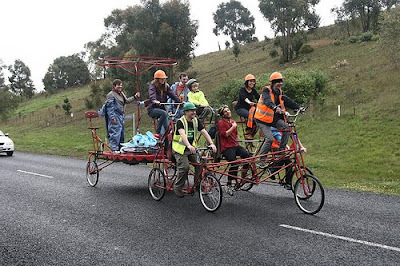 Yarra Climate Action Now worked with Socialist Party councillor Steve Jolly on developing the motion, which was subsequently strengthened by Greens councillor Sam Gaylard. It was supported by the Greens, Socialist Party and independent councillors Fristacky and Smedley. Two Labor Party councillors voted against the motion without giving any good reason for doing so, while Yarra Mayor, Jane Garrett, also a Labor Party member, was mysteriously absent from the vote. YCAN is pleased that Yarra City Council has stood up for its residents and urged the other levels of government to urgently reduce Victoria’s greenhouse gas emissions. We congratulate the councillors that passed this motion. We would also like to express our anger and frustration with the Labor councillors who voted and argued against it. At a time when the Brumby Government is desperately trying to create some green credentials, this vote has shown that Labor is still deep in the pocket of the coal industry. In other news, at the same council meeting, the YCAN Local Action Group had yet another win, presenting a submission to Council on the Carbon Neutral Action Plan, which received commendation from the councillors and some points of which were acted upon immediately. (e) write to the Prime Minister, Victorian Premier, Victorian and Federal Energy Ministers, and the Victorian and Federal Opposition Leaders and local members to advise its position. Hazelwood Power Station is responsible for almost 15% of Victoria’s greenhouse gas emissions and 3% of Australia’s. It consumes 27 billion litres of drinking water per year – enough to supply Melbourne’s water needs for a month. It takes just four days for Hazelwood to cancel out the entire year’s worth of emissions saved by Victorians though the 5-star energy efficient homes program. That’s 650,000 black balloons every minute. Hazelwood is Australia’s most polluting power station and one of the most polluting in the industrialised world. Hazelwood Power Station was due to be closed in 2009. 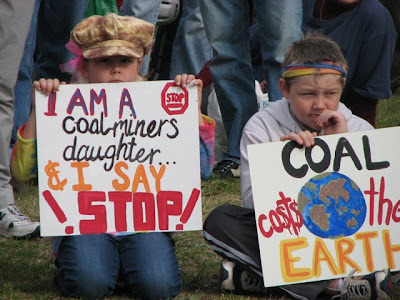 However, after privatisation in 1996, in 2005 the State Government extended its coal allocation out into the 2030s. The climate science is clear that there is already too much carbon in the atmosphere to prevent runaway warming. We urgently need to stop emitting carbon and remove it from the atmosphere. There are renewable energy alternatives to coal-burning that are commercially available now. Wind and baseload solar thermal power can replace coal, and Victoria has these resources in abundance. The work of the University of Melbourne Energy Institute and Beyond Zero Emissions clearly shows that Hazelwood can be replaced with a mix of these technologies within a few years. Basing the manufacturing of these renewable energy components in the Latrobe Valley can ensure that workers in coal-burning areas can transition to other quality jobs. Victorian greenhouse gas emissions continue to rise alarmingly. Replacing Hazelwood with renewable energy is the first step in the necessary shift to zero emissions technologies that will ensure Victoria’s energy security and productivity. Sunday 10 October, 11am-4pm at Hazelwood Power Station. 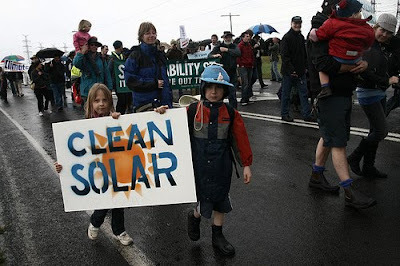 On 10/10/10, the International Day of Climate Action, join the peaceful community protest for renewable energy. The urgent decommissioning of Hazelwood Power Station. Replacing its capacity with renewable energy and energy efficiency measures. A just transition for coal workers through the development of renewable energy and energy efficiency manufacturing facilities in the Latrobe Valley. To make it a success, we need YOU to help create Victoria’s “first” solar thermal power station – we’ll provide the mirrors, you help create the solar array, click here to find out how! See http://www.switchoffhazelwood.org/ for further information. 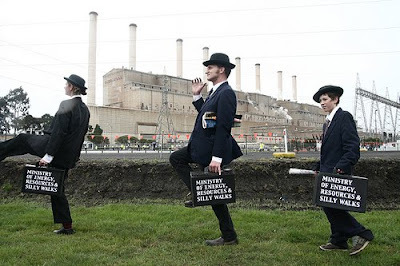 The Climate Action Summit took place in Canberra last weekend. Prior to the summit the Climate Action Centre prepared a climate action reader, Talk Climate, for the Summit. In this election year with the stakes higher than ever, it is a particularly thought provoking read. Included in the reader is a piece penned by Damien Lawson from the Climate Action Centre and Taegen Edwards from Yarra Climate Action Now dealing with the upcoming campaign currently to be driven by a coalition of Victorian climate action and environmental groups to replace Hazelwood power station with a mix of less polluting or non polluting electricity generating capacity. Hazelwood is of course Victoria’s oldest, least efficient, largest and dirtiest, brown coal fired, power generating facility. Hazelwood was due to be closed in 2005. Unfortunately, and against the advice of a raft of environmental groups, the State Government decided to extend the operating license of this obsolete facility until 2031. Alone it is responsible for 15% of Victorian annual green house gas pollution and 3% of the Australian total. The summit reaffirmed the climate movement’s opposition to the government’s trading scheme and set out key policy goals for clean renewable energy, green jobs and the need for an immediate carbon levy. The coal industry was made a key target. Among the agreed goals of the summit was the replacement of Hazelwood, with clean energy by 2012. As Yarra Climate Action Now is one of the groups supporting this campaign you can expect to hear much more about this as the year passes. Watch this space. "This is where the black balloons really come from." I eavesdropped as the father explained to his very young daughter that the black balloons really came from this place, not the washing machine. Looming over us was the Hazelwood coal power station, the single biggest source of greenhouse gas emissions in Australia. Around us were 500 other people, some of who had travelled long distances, as well as many locals, to help send the message that for our own survival, we need to urgently transition away from coal and towards renewable energy and energy efficiency, and that this means switching off Hazelwood and finding alternative jobs for the workers inside. Scientists have made it clear that getting out of coal should be our number one priority for reducing emissions and avoiding runaway climate change. We had spent the night before camping with 230 people, discussing tactics for the day and more general climate change topics, as well as sharing a meal and listening to some fantastic live music. On the day, despite early rain, the atmosphere was positive and friendly. We were welcomed to country by Robbie Thorpe, a local Gunai elder and heard from fantastic speakers. We marched to Hazelwood and were met with a heavy police presence. 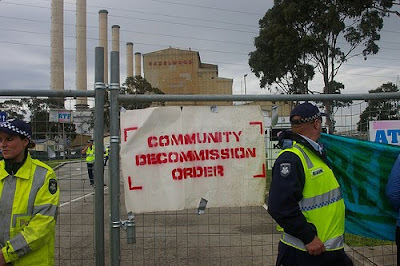 Twenty-two people managed to get over the Hazelwood fence and deliver a community decommission order. They were charged with trespass. There were many more willing to commit civil disobedience, but were not nimble enough to get over the fence without the police stopping them. We received blanket media coverage that night on TV and in the papers the next day. A great time was had by all and the importance of peaceful civil disobedience made clear. It was an historic day for all of us fighting for a safe climate future against the insanity of our governments and fossil fuel industries. It’s time – switch off coal and switch on renewables! See you at the next protest! “Switch off Hazelwood. Switch off Coal. Switch on Renewables” is a day of fun, creative and inspiring peaceful community action at Victoria’s dirtiest secret, Hazelwood coal power station. 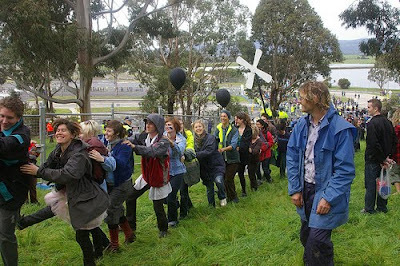 This march and protest at the gates of the Hazelwood Power Station, is organised by community members who care about climate change. We need you all there! 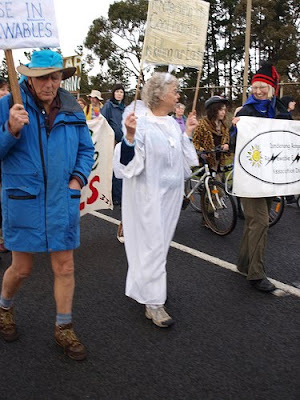 The Hazelwood protest is the community climate movement’s big protest action in the lead up to the Copenhagen negotiations. It’s timed to coincide with the peak arctic ice melt, and it’s far enough ahead to have a bearing on the Copenhagen negotiations, which are happening now! The day is building to be a big success. You can protest outside the station with banners, clowns, some great creative and positive props, music and speakers – hopefully to include Senator Christine Milne, one of the few politicians advocating a reasonable science based approach to climate change. 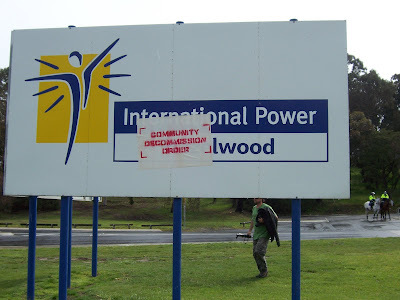 At some point in the day, the second arm of the protest will attempt to walk on to the station to serve “Community Decommission Orders” to Hazelwood Power Station. 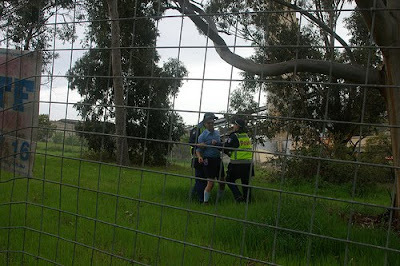 This completely peaceful act of protest may result in those people being liable for charges of trespass: a decision that people have been willing to take because of the scale of the threat to our well-being posed by the climate crisis. Participants in both groups are equally important! Coal burning power stations are one of the main contributors to climate change, which poses an enormous threat to the world and it’s inhabitants. Hazelwood is one of the dirtiest coal power stations in the industrialised world. It releases an average of 17 million tonnes of CO2 into the atmosphere every year and represents around 5% of Australia’s emissions. It was scheduled to be shut down this year, however it was given a lifeline by the ALP state government in 2005 allowing it to continue operation until 2031. We need support renewable energy instead and extend the lifeline to our planet! We are advocating an urgent transition to 100% renewable energy and away from coal. This is already technically possible. We are also demanding that the government support the Latrobe Valley community in a transition away from fossil fuels towards a clean energy manufacturing hub – protecting jobs and giving us all a future. 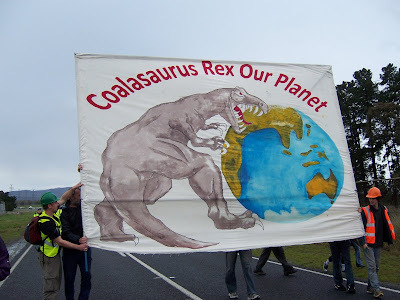 Replacing dinosaurs like Hazelwood with renewable energy is the first step in this transition. Our State and Federal Governments are failing on climate change. Their policies are nowhere near what scientists are saying is needed to avoid catastrophe. 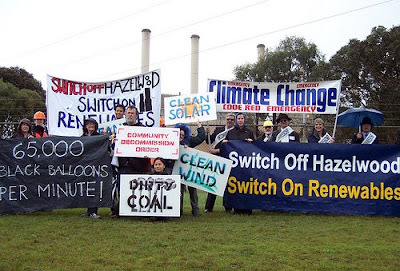 On 11am on Sunday September 13, 2009 we will meet on the corner of Broadribb & Nadenboushs Rd (South of Morwell) and march to the front gates of the Hazelwood, rallying to ‘Switch on Renewables and Switch off Coal’ and slap a Community Decommission Order on Hazelwood Power Station. The event will be well organized with speakers, media link ups, first aid and medical help available but you’ll need to bring your own food and drink. There is a weekend skills workshop coming up this weekend, 29/30 August: to build skills for future climate protest organizing as well as skilling up for the day . Look on the website for details! Climate change is a threat of unprecedented proportions to our world and all it’s inhabitants. People who have never been involved in protest before are getting involved in protests over limate change. The science says we already have too much carbon in the atmosphere to avoid run away climate change. We need to motivate our politicians to act fast enough – that means stopping burning coal, building renewable energy ASAP and sequestering carbon out of the atmosphere. We need to speak strongly, loudly and persistently until it happens!